Q: What are the hours and locations of the financial centers for Farm Bureau Bank? 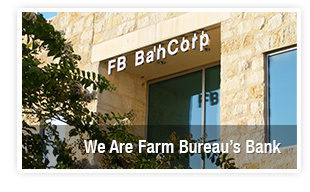 Farm Bureau Bank is a direct bank and does not have physical branches. Banking services are available through our 24-hour Internet Banking service, 24-hour automated phone service, and by mail. This allows us to offer very competitive interest rates. If you would like to establish an account with Farm Bureau Bank, please e-mail us with your address and we will mail you information on the products and services we offer including our current rates or you may contact us at 1-800-492-3276, Monday - Friday 7am - 7pm CST or Saturday 8am - 12pm CST to speak with one of our specially trained Personal Bankers. For your convenience you can also visit your local Farm Bureau county office and pick up a product brochure or application. Q: Must I be a Farm Bureau Member to open an account? As a federally insured financial institution, we cannot require that you have a Farm Bureau membership to open a bank account. However, a Farm Bureau membership may be required to qualify for certain offers, specials and premiums. Q: How do I become a Farm Bureau Member? Membership is based on the individual state, click here to find your local Farm Bureau. Q: Which federal government agency regulates Farm Bureau Bank? As a federally-chartered savings bank, Farm Bureau Bank is regulated by the Office of the Comptroller of the Currency (OCC). For more information on the OCC go to www.occ.treas.gov.